Living in a musical backwater like Victoria, BC does have amazing lifestyle benefits, but if I'm invited to a cool audio event in a musical capital like New York City, I'm in. I read about a similar event last year and was very happy to receive a kind invitation from McIntosh Group this year so I could report on the new gear and all the fun. First, the location. A swanky, full-on townhouse in SoHo. The World of McIntosh Townhouse (WoM) is so amazing, it’s been highlighted on Open House NYC. Described as: WOM (World of McIntosh) is the brand for McIntosh Group Experience Centers, special places where people can have a real experience of McIntosh Group’s brands products. WOM Townhouse in New York City is the headquarter of McIntosh Group and serves as an invite-only venue where guests are able to experience the exclusive McIntosh Group’s products and lifestyle, through an amazing sound experience as well as exclusive events. In the heart of New York City’s upscale SoHo neighborhood, is a 5-story expression (12,000 sq ft) of The Art of Sound Experience of the McIntosh Group family (McIntosh Laboratory, Pryma, Sonus faber, Wadia Digital, Audio Research and Sumiko Subwoofers). McIntosh Group’s David Mascioni sent me the very detailed rundown. As they say in London, it was all ‘laid on’. The photos and the videos do not do the gorgeous location justice. As WoM is the umbrella for some of the most prestigious legacy brands in the audiophile cosmos, amplification and ancillaries were all top drawer. A high-end stable of the best kit. 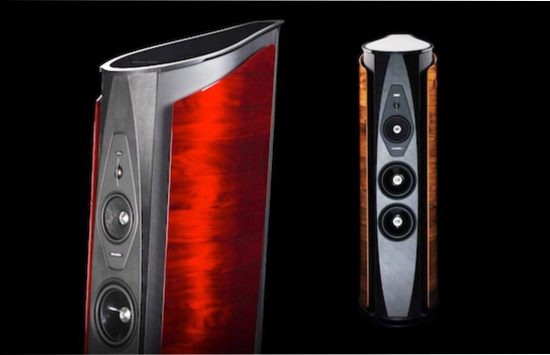 Both loudspeakers are architecturally impressive towers featuring advanced technology and exquisite workmanship. McIntosh explains: The XRT2.1K Loudspeaker ($130,000/pair) represents the next evolution of McIntosh home audio speakers. Borne from our 45+ years of designing speakers, the XRT2.1K is a full range system that provides spacious sound reproduction with an unusually deep sound stage. Standing 7 feet (2.1 meters) tall, a pair of them will grab the attention of every person in the room. The XRT2.1K utilizes our renowned line array speaker principles to produce an even sound dispersion pattern. Listeners closer to the speaker will not be overwhelmed by extremely loud sound while those further away will notice hardly any drop off in sound level. A 4-way speaker, the XRT2.1K produces excellent sound quality at all levels of the human audio spectrum. The unique left and right speaker each use a total of 81 drivers consisting of (6) 8” woofers, (2) 6.5” low frequency midranges, (28) 2” upper frequency midranges and (45) ¾” tweeters, to deliver a nearly unparalleled sound reproduction. Sonus faber describes its benchmark speaker: Don’t let the familiar face fool you: Aida ($130,000/pair) maintains the typical lute shape and the typical design elements that made it so recognizable, has been completely overhauled, embracing the most advanced electroacoustic developments of the latest years. This “3 and 2/3 way” loudspeaker system features the patented “Stealth Ultraflex”, for a better bass extension, the “Anima Legata” system and the “Tuned Mass Dampers”, for maximum elimination of inner spurious vibration, the patented “Zero Vibration Transmission”, for saving the listening environment from the spread of vibration and for a better performance of the infrawoofer, and the “Sound Field Shaping” technology, for a new dimensionality of sound and perceived size of the sound-stage. The most radical among the new changes is the selection of all-new driver systems, all of them rigorously “made in Italy” and featuring a Neodymium motor system. I’m unsure whether very high ceilings are beneficial to quality sound, but the McIntosh gang got both speakers to sing, even with heavenly boundaries. A delicious breakfast and lunch both days gave the audio professionals time to mix and mingle. The buzz was palpable about the very expensive company benchmarks. McIntosh Labs’ components accompanied the XRT2.1Ks and Audio Research the Sonus faber Aidas. What, about a million bucks worth of kit on show? Hell yes, it sounded good! You’ll need a big room, though. Be warned. Both speakers filled the well-treated spaces with superbly curated playlists (the Aidas played in a smaller room on the fourth floor). No matter where I sat, my ears received a wide and deep soundstage with individual instruments sounding shockingly real (a Ben Webster track on the McIntosh speakers had me shaking my head). The resolution of both speakers playing bog standard CDs and files, was astounding. Bass authority? Incredible! I never heard the original version of the McIntosh speakers, but I reviewed the original Aida, and even on a relatively brief audition, I can tell you the new Aidas are a significant upgrade. 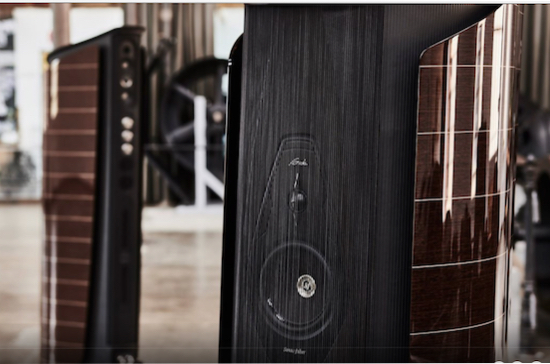 Will Kline, North American Brand Manager, Sonus faber and the Aida Speaker. The World of McIntosh team.